Show Old Man Winter who's boss this year and save yourself trouble by making sure you’re prepared for any roadside emergencies. Here’s what items to make sure you have in your car at all times, should you find yourself at the side of the road in sub-zero temps. Dried snack foods like granola or energy bars and beef jerky are perfect in the event you’re stranded for a few hours. Handy for clearing snow from your wheel, chipping away any ice and digging out a car if need be. You’re not the only one who doesn’t like being out in the cold for long. 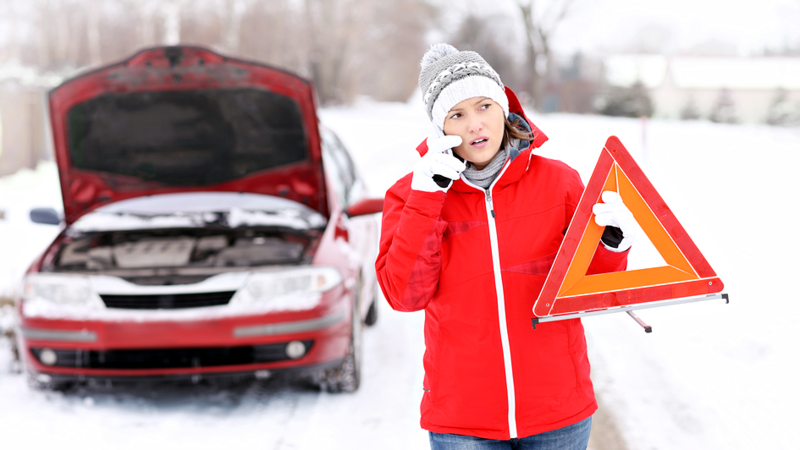 Your car battery can become depleted and die if it’s too cold out. Attach the cables to another car to bring yours back to life. This should be a no-brainer. An ice scraper and snow brush can be a lifesaver on those early winter mornings to quickly clear your windows of snow and ice. Don’t forget to clean your mirrors and headlights too! Might be a good idea to keep this one in your car all year round. Things to include in the kit are: different size bandages, gauze dressing, safety pins, disposable gloves, scissors, tape, cleansing wipes and antiseptic cream. Don’t get stuck in the cold without extra warmth. Mittens, a scarf, tuque and a spare blanket can make all the difference if you’re stuck in a stranded car or need to walk to assistance. Don’t forget to layer! Flares or reflectors will come in handy - especially in snowy conditions - if you need to be located or to help other drivers see you to avoid being hit. No flares? No problem. A bright-coloured bandana can come in handy to wave down help. Traction is your best friend when stuck in snow. Throw a little sand or cat litter under the tires to get you out of icy situations. It’s common to see cars that have slid into ditches during the winter. Save yourself the time and the cost of waiting for a tow truck by being equipped with tow straps. All you need is another car to help pull you out. A flashlight is crucial if you’re changing tires or doing car repairs at night. If you don’t want to worry about batteries, there are many wind-up options available.